Anyone who knows me knows I love dogs. 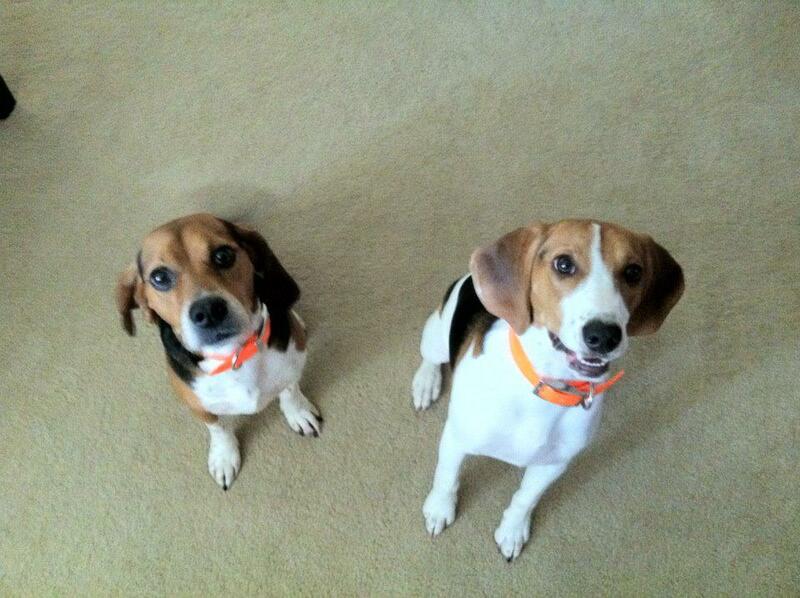 In particular, I love my dogs, Cooper and Lambeau, the dynamic beagle duo. A still moment like this means only one thing. I have food. And in all seriousness, dynamic is the best way to describe them. Cooper (at left in the photo above) is super chill, sleeps most of the day and wants nothing to do with most forms of exercise. He’s never successfully played fetch and he’s a hunting dog to the core – you cannot stop his nose from working. He’s sort of a strong, silent type: he doesn’t bark much, but when he does, boy do you take notice. Lambeau, on the other hand, is a bundle of energy and cries, well, a lot. He LOVES playing fetch and will chase a tennis ball like his life depends on it; he’s also quite good at leaping to catch them mid air. They both have their adorable – and not so adorable – quirks, but I love them both any way. Which brings me to the next point. For those of you who don’t have beagles, I’d like to inform you of a little something known in the doggy world as, “the reverse sneeze.” While it’s mostly harmless and he’s been doing this for years, it’s a little bit ridiculous to watch. This isn’t a particularly bad episode, but he’s been doing this for about the last 30 minutes off and on. He’s more or less stopped now (I keep going out to check) but I feel so bad for the poor little fella! Of course, you can find videos of other beagles similarly ‘sneezing’ online if you want to get a better picture. Lambeau has done this once or twice, but it’s almost always Cooper who has these fits. The only thing there is to do when this happens is try to calm them down, or what typically works for Cooper is to cover his nostrils like I do in this video. It forces him to swallow and sort of … reboot. Not sure what else to call it. And just when I thought he was calm, I can hear the snorts coming from the living room. Oh the joys of being a dog mom. Doesn’t even do it justice, normally such an episode includes lound “honking”. It is weird. *Loud, not lound. Lound is apparently loud hound honking.